Clare, last year’s Munster MFC runners-up, earned a two-point win this evening. 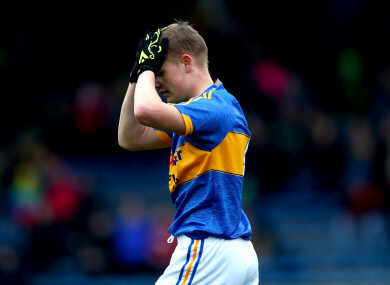 A dejected Christy McDonagh of Tipperary (file photo). THE CLARE MINOR footballers qualified for their second successive Munster final following their win over Tipperary in Thurles this evening, in a game that started 22 minutes late due to the late arrival of the Clare bus. Two late points from full forward, Shane Meehan, guided Clare into the decider against Kerry. Following a stop-start first half, Tipperary led 1-2 to 0-4 at half-time. They looked much sharper than Clare in the opening minutes and kicked their entire first half tally in the first 16 minutes. Tipperary wing forward, Max Hackett, put away their goal in the tenth minute. He was left completely free in front of goal and expertly netted Kevin Hayes’ pass. Kyle Shelly had pointed the home sides first score in the third minute, while Seán O’Connor added their second point. Thomas Kelly was the first Clare man to raise a white flag, while Emmet McMahon landed a top class effort from distance. In the closing minutes of the first half, Meehan, pointed a brace of frees, won by Mark McInerney and Kelly. Clare kicked eight first-half wides, while Tipperary did likewise five times in a half hour’s football that often lacked quality and incisiveness. Corner forward, Kevin Keane, scored the Clare goal following a Chibby Okoye pass, while Emmet McMahon fired over two invaluable second half points to help Clare over the line. 17. Rhys Bryon for Keith Ryan (half-time). 21. Jamie Holloway (Carrick Swan) fir Devon Ryan (45). 23. John O’Sullivan (Galtee Rovers) for Rhys Byron (59-inj). Email “Banner see off Tipperary to book second consecutive final spot after delay in Thurles ”. Feedback on “Banner see off Tipperary to book second consecutive final spot after delay in Thurles ”.